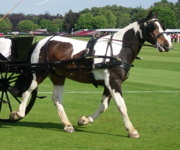 Our leather carriage driving harness is produced on the premises using selected English hides and best quality fittings and furniture throughout. It is only available to customers in the UK. We will be glad to adapt or alter to suit your own particular requirements or to match an existing harness. "Country" and "Concours" harnesses can be supplied with a neck collar instead of the standard breastcollar and for the smaller ponies, donkeys or mules there is the option of our Flat Collar. For a well fitting harness it is necessary to take a number of accurate measurements and for this reason we prefer to do this in person. Customers are welcome to bring their animals to our premises (by prior arrangement) or we can make a visit within a 100 mile radius of workshop. There is a charge for this visit which we calculate from the distance travelled. The sizes given within these pages are as a guide only since each item is designed and made to fit your particular horse, pony, donkey or mule. We will be pleased to quote you for your exact requirements. 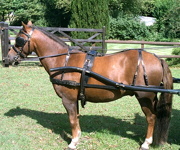 It is important that the harness is made to suit the build of the horse/pony and shows off the animal's physique. It must also look right for its intended use. For instance a harness for a fine gig needs to be elegant with added ornamentation; for a working turnout the harness will be heavier with less ornamentation. 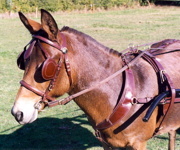 When designing a harness we often refer to the "Equine Album", a saddlery and harness catalogue from the turn of the twentieth century. The pages contain accurate drawings of many styles of harness and we can scale them up to take measurements from. Some sample pages are shown below. 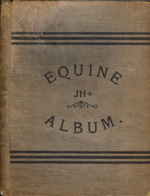 The sizes given within these pages are as a guide only since each item is designed and made to fit your particular horse, pony, donkey or mule. We will be pleased to quote you for your exact requirements. or telephone us 01342 844452 (if you are calling internationally +44 (0)1342 844452 - please remember the time difference!). Mail address - Greenwood, Smallfield Road, Horne, Surrey, RH6 9JP, England. Personal callers welcome by prior arrangement. If you wish to place an order please ask for a copy of our measurement chart and order form (see note above regarding complete harness sets). The required measurements are clearly shown but if you have any difficulties please give us a call. We require a 25% deposit at the time of order, with payment in full upon completion. All prices are in UK Sterling. Post and packing will be charged at cost. 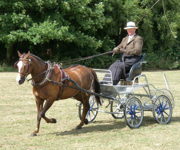 In addition to our equine harness we also make-to-measure canine harness - dog driving harness for the larger breeds i.e. Newfoundland, Bernese and terrier harness for Staffordshire Terriers etc.